Getting to live near the ocean was a big reason for us to leave the otherwise perfect, beautiful Switzerland. Coming from Denmark you are notoriously close to water since the country is no bigger than a stamp and getting the opportunity to enjoy the sea made the decision to move to USA a lot easier. 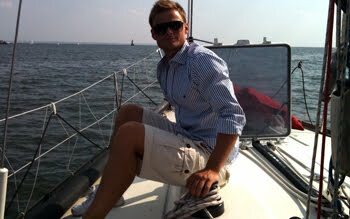 On saturday we had the pleasure of sailing the Long Island Sound with friend's friends Art and Catherine. They own a beatiful, classic Scandinavian sailboat in which they showed us around the Sound. The boat is located in Stamford, so sailing to Long Island takes less than an hour. With temperatures in the 90's getting out on the water is heavenly refreshing. Even cruising slowly out of the harbour cools you down like an air condition compared to being on dry land. I starten gik det roligt og stille for sig, så der var tid til at nyde udsigten og blive kølet af i let brise fra sydvest. Det varede dog ikke ved, sejlene skulle op og da jeg var den eneste af gæsterne, der havde prøvet det før fik jeg lov at få lidt sved på panden i sommervarmen. However, work has to be done to get the ship sailing, so after leaving the harbor area, we set sail and got on our way at wind power. Selvom man er aspirerende triatlet er der stadig en smule muskelvæv tilbage i armene. Anja was on lookout duty on the front deck, in safe distance from the waves that came over the side of the boat in a few occasions. Nothing beats wind in the hair and the smell of salt water on a sunny saturday afternoon. Meanwhile the cockpit was full - everyone taking a turn at the steering wheel. After zig-zagging the Sound we returned to the harbour around 7:30 and got ready for a nice Italian dinner. Thanks to everyone for inviting us and for the lovely day at the sea! Felt almost like home.